Dissolve the sugar in vinegar. In a large bowl, combine sugar vinegar mixture, garlic, soy sauce, slat ang pepper. Arange beef in a marinating dish. Pour vinegar soy sauce, mixture over beef. Allow to marinate in refrigerator a few hours or overnight. When ready to cook, heat olive oil in skillet. 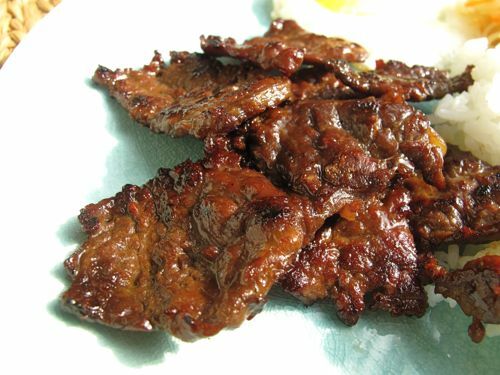 Drain beef slices and fry in hot oil until fully cooked. Serve with rice. End.